Lang's Old Car Parts is a family owned company with a true passion for the Model T Ford. We have the most complete catalog available on the market, including new and used Model T parts. We also carry a large selection of accessories, books and instructional movies. Ever since our founding over 35 years ago, we have worked hard to provide the best Model T parts with the great customer service and free technical support. Three quarters of our staff own a Model T. We have a passion and dedication to the hobby. If you need any technical assistance with your car just give us a call and we will try our best to find the answer. 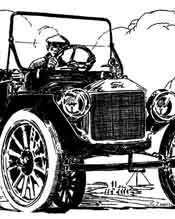 Please explore our Model T Parts catalog online and if you would like a catalog mailed to you please go to the Request A Catalog. If you are unable to find the Model T part you need or would like to check our used part stock please feel free to give us a call at (800)872-7871. Test your Model T part knowledge here with our quiz. We will randomly give you a picture of a Model T part and you will have to select the correct description from the multiple choices below. There is no limit to how many times you can take our quiz and every time you take it will be different. The best of the best will earn a place here on our High Score Board. So test your skill now and see how well you can do.